The Great Pyrenees is a large, powerful livestock guardian. This breed should be protective and confident. Aggression toward other dogs is inconsistent with his natural personality. However, certain environmental factors can draw out unwanted aggression in this otherwise gentle giant. As a livestock guardian, he is naturally suspicious and wary of potential threats to his flock. In the domestic context, he will view his family as his flock. 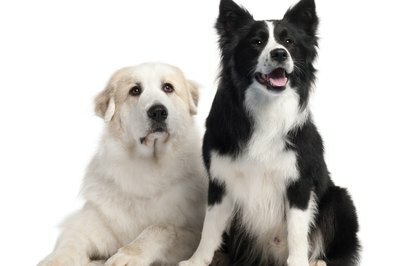 If a new dog, even one of the same breed, is introduced into the household, the Great Pyrenees may become protective over his territory and his flock. If the aggression is between two dogs who have been living together already, sexual maturity may be a contributing factor, especially between male dogs. Since the Great Pyrenees is naturally inclined to protect his territory, when bringing a new dog into a household, it’s beneficial to make the first introductions on neutral territory, such as a park. This way, the dogs are familiar with one another before being forced to occupy the same space. Spaying and neutering is a potential solution too, as unsatisfied hormonal drives can cause territorialism. If you’re reluctant to alter your dog, seek the advice of a professional trainer. As pack animals, dogs strive to establish a social hierarchy. Aggression plays a key part in how the dogs establish who is the top dog. Aggressive gestures and vocalizations enable the dominant dog to assert himself without resorting to violence. When a Great Pyrenees is displaying aggression, it may not be as obvious as it is with other breeds, due to their naturally slow, cautious movements. Interfering with the battle for dominance can be counterproductive. Once the dogs have established their relationship, aggressive behavior tends to subside and harmony prevails. Monitor the dogs behavior and only intervene if you suspect either dog is at risk of injury. Tensions may arise between two Great Pyrenees because of resource guarding. Dogs view food, sleeping areas, toys and sometimes other objects as resources to be protected. One dog may think that the other is attempting to steal his coveted resources, for example if he picks up a toy or approaches the food bowl. This can lead to aggression. Feed the dogs separately and remove the bowls to avoid unnecessary tension at feeding time. Remove toys and use training sessions to teach each dog that the resources are privileges to be earned. Correct the dogs with verbal reprimands and distraction when they act protectively over supposed resources.